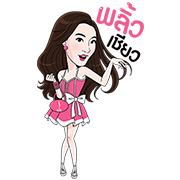 http://www.line-stickers.com/ – Pancake & Her Beautiful Hair Line Sticker | Beauty Hot Pro is proud to present these beautiful Pancake hair stickers (?????????????)! Friend Beauty Hot Pro’s official account to get them. Available till March 19, 2015. Previous post Badlapur: Don’t Miss the Beginning!